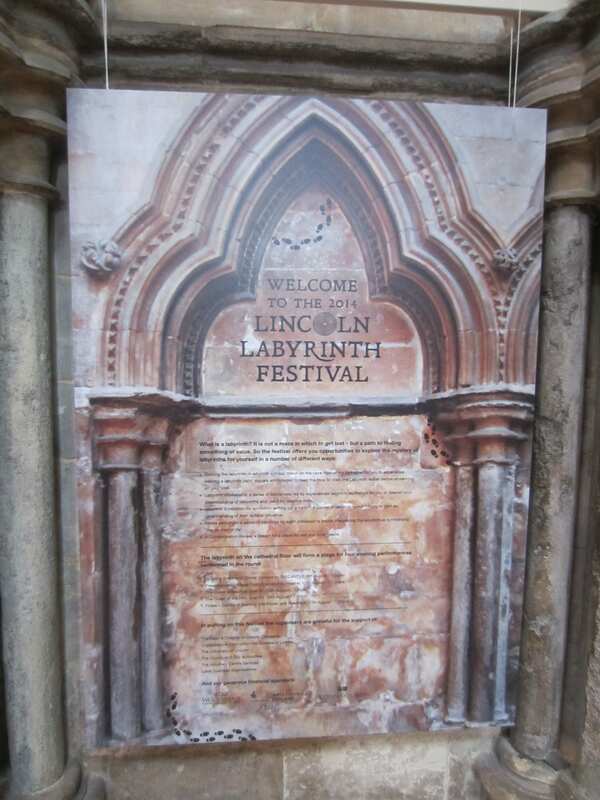 During August, a labyrinth was chalked onto the stone floor on Lincoln Cathedral and visitors invited to walk the twisting path into the centre and out again. In the arches on the right were a series of information panels. My connection with labyrinths goes back many years. 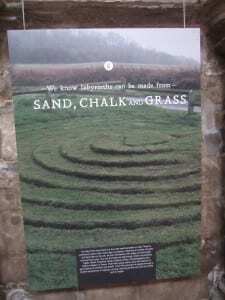 The interest led to Walking the Labyrinth, set up to document their use within higher education, in particular as tool for learning development. 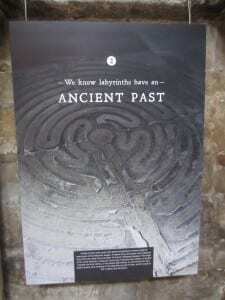 What we know about labyrinths is contentious and for me this is part of the attraction. Because they’ve kept their secrets around their origin and use so well, they have become a vehicle for a number of different interpretations. When I wrote the text for the labyrinth festival, my aim was to bring together what is known based on what can be evidenced. I wanted to emphasise a labyrinth is not a maze, despite what the Oxford and other dictionaries say, and to reveal how the symbol is old, more ancient than the church itself. I thought I was writing with accuracy and respect but with hindsight I think I may have been naive. The experience is helping me rethink my research, in particular how we know the world. 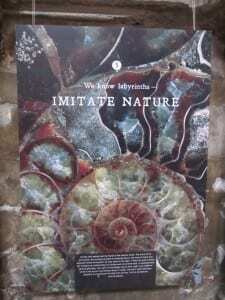 The ologies of Ont and Epist, which I’ve struggled with since the beginning, are best understood through application to daily life. 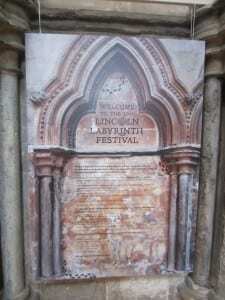 From the start I wanted the panels to narrate the story of the labyrinth, step by step, from past to present. In my mind the words would run from top to bottom and be supported with appropriate – but secondary – images. 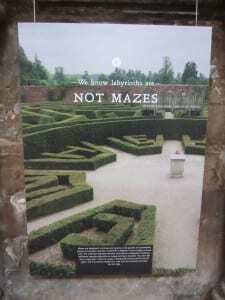 Instead the images were given priority and the text squeezed into a block; positioned too small and low to be easily read while the plan to reproduce this as an information leaflet to take away didn’t happen. 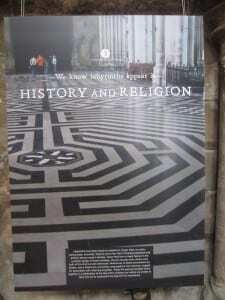 Other panels, laid out in the style I had imagined, were more accessible and stressed the connection between the labyrinth and christianity. Reading these, I saw how my text could appear as if I was trying to do the opposite. Critical Realist Roy Bhaskar (1978) wrote about an ontological distinction between three domains of reality: empirical (observed reality), actual (interpreted reality) and causal (generative reality or mechanisms of change). We bring to empirical situations our existing knowledge which in turn shapes our expectations; but knowledge is fallible and constantly open to change. 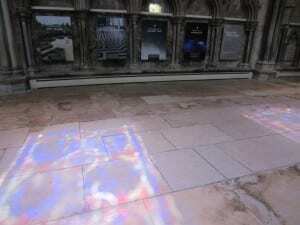 I walk into Lincoln Cathedral with the expectation I’ll be surrounded with design appropriate to the Christian religion. This interpretation derives from the sum experiences of my life (my actual domain of reality) which are reinforced whenever my expectations are confirmed. 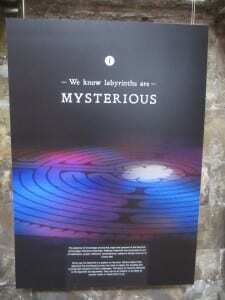 The labyrinth text introduced a causal reality i.e. something different and possibly unexpected within the context of the cathedral. 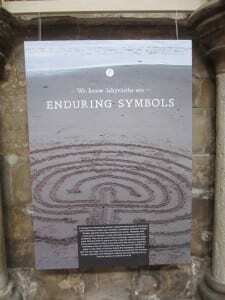 For me labyrinths can be both secular and sacred and I set out to bring the two dimensions together. I don’t feel I succeeded but maybe I have a better understanding of why this was so. To often we can’t ‘see’ from the inside. 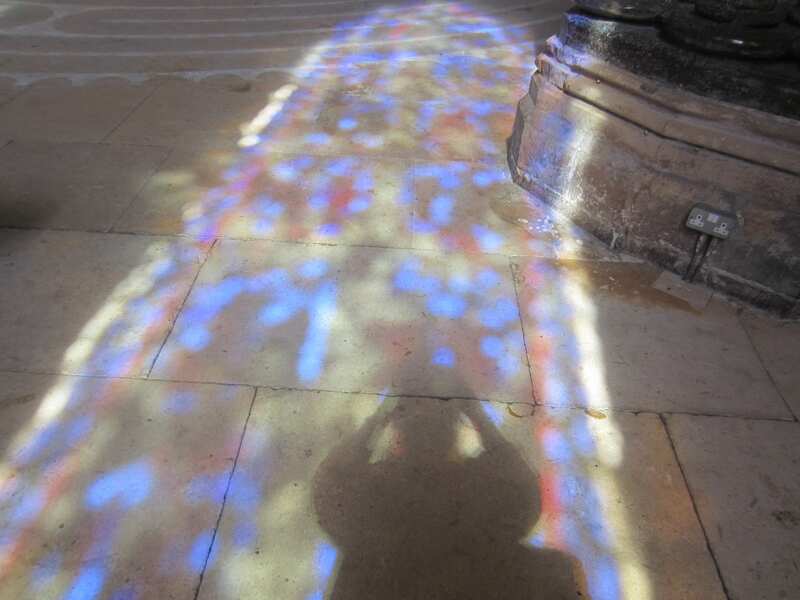 It takes the alchemical process of reflection on action to produce insight. With hindsight I may have been blinkered by my own ‘actual’ reality. 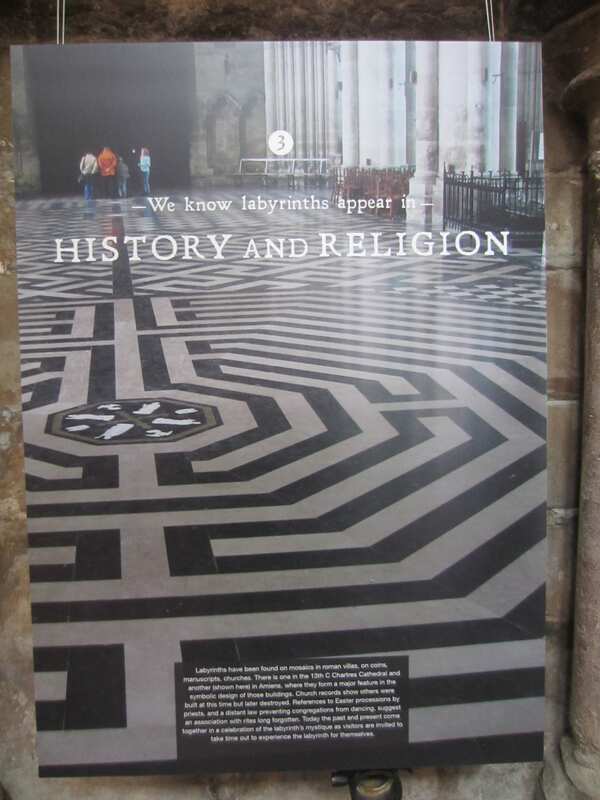 Excited by the possibilities of promoting the labyrinth symbol within the cathedral walls, and able to rationalise the secular/sacred duality within my own mind, I failed to grasp how this might constitute a challenge – however small – to the institutional ideology of the church. 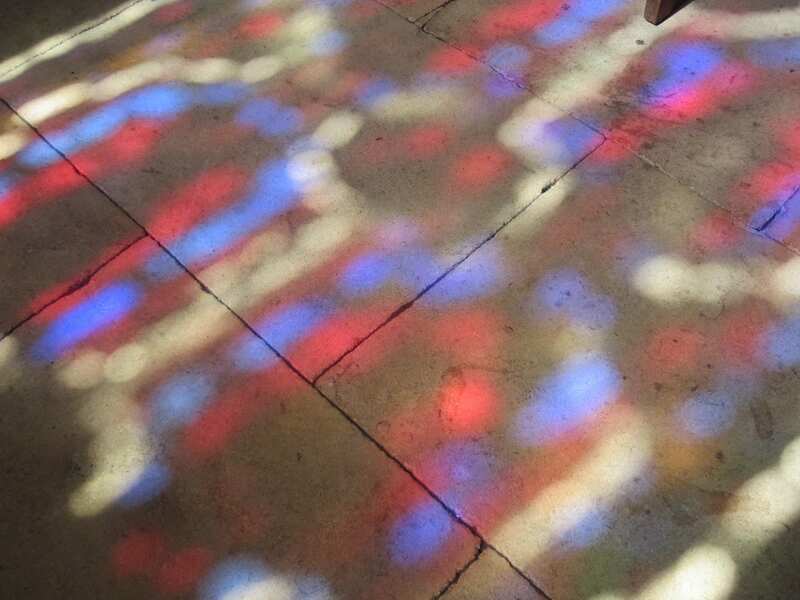 The reduction of a message which was outside of doctrine – albeit in my mind running parallel – diluted the opportunity to pass on this knowledge. 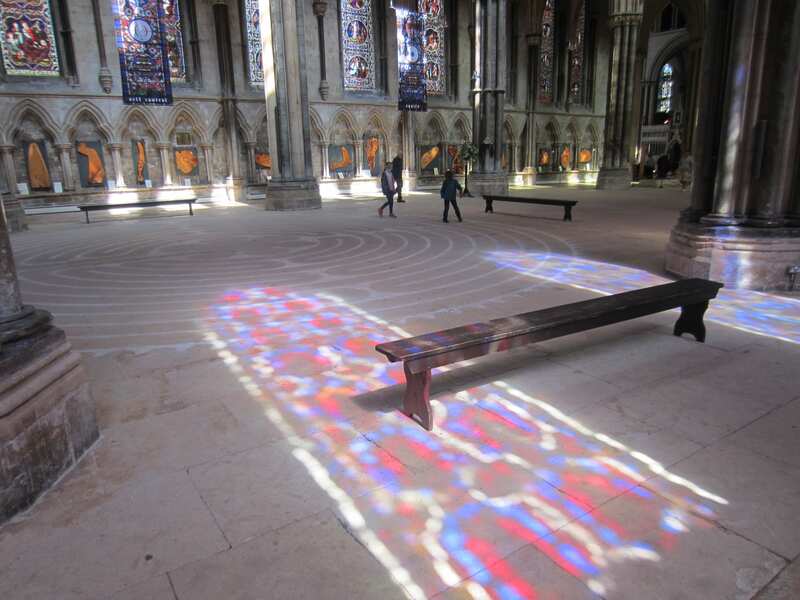 Regardless of the faux pas-panels, the highlight for me was the central position of the labyrinth itself; precisely chalked across the nave, and seeing people take the time to walk the circular paths. 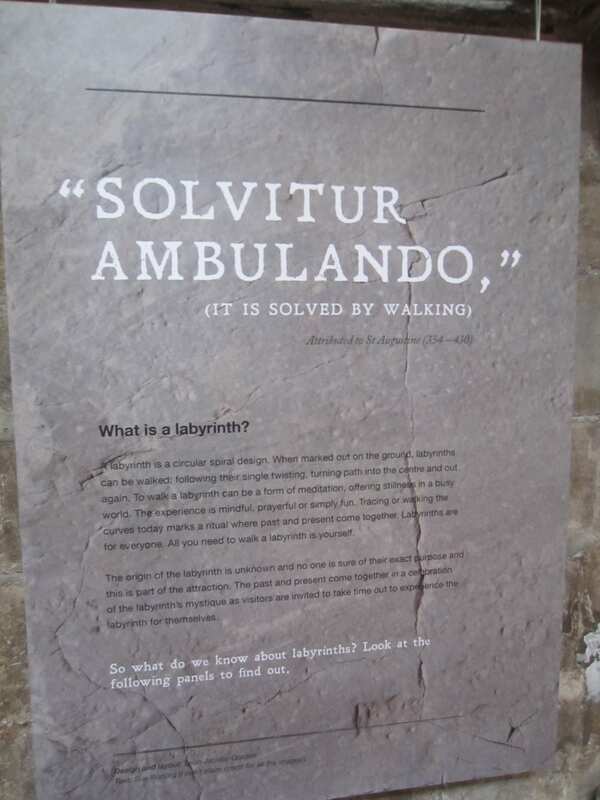 Solvitur Ambulando. 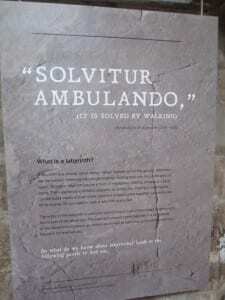 It is solved by walking. There was a moment when the sun shone through the stained glass windows and cast coloured patterns across the stone floor, lapping onto the outer paths of the labyrinth. I’m not sure I’ve been in a church when this has happened in such a spectacular manner. Maybe God was working in a mysterious way after all.